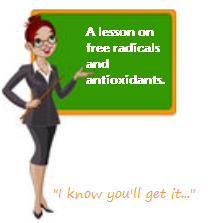 First, some science...I know, I said no big words or hard to understand concepts, however; a little knowledge of science comes in when talking about free radicals and antioxidants. I promise I will make it as painless as possible. The atom is a basic unit that is made up of protons, neutrons, and electrons. The protons have a positive charge, the neutrons have a neutral charge, and the electrons have a negative charge. The negative and positive charges attract each other. Two or more atoms can bound together to form a molecule. This is were the problem comes in. Free radicals are unstable molecules with extra "free" electrons that are looking for a connections. Think of it as an unstable or "free" family member. When they are not around, the family attraction is great. Everyone is getting along and things are running smoothly. Then it comes. This extra unstable electron brings in its negative force and is looking for something to attach itself too. So the free radical sees all the wonderful cells and decides to latch on to them. The free radical will start a chain reaction that damages the cells and causes constant inflammation. Antioxidants neutralize these electrons by binding them, causing them to settle down, therefore reducing their damaging effects. Vitamin E and vitamin C are both super antioxidants that prevent free radicals from latching on to cells and causing damage.